Trump lashed out repeatedly at John McCain over the weekend. 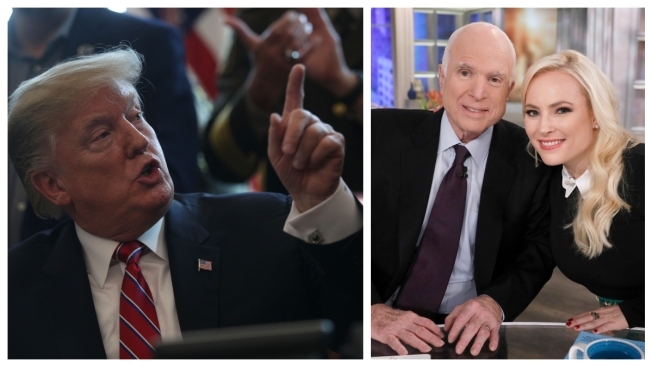 Meghan McCain said the president has a "pathetic life"
Meghan McCain called out "pathetic" Donald Trump after a series of tweets attacking her father. "The View" co-host Meghan McCain finally had an opportunity to respond on air Monday following a series of tweet rants by President Donald Trump over the weekend that besmirched and ridiculed her late father, deceased Arizona Senator John McCain. Trump lashed out at McCain for his crucial vote against repealing Obamacare in 2017. He later spoke out regarding reports in conservative media outlets that cite court documents that say a former aide to McCain was the source of a leak that put a Trump opposition-research dossier compiled by former British spy Christopher Steele into the hands of multiple media outlets in late 2016.